Present Owner: Regal Greetings & Gifts Inc.
Francis Bethel McKenzie died in Brandon in December 1896 and bequeathed his business to his son, Albert, who renamed it A.E. McKenzie & Company in 1897. Dr. Albert E. McKenzie (1870–1964), who operated the company until his death, left a legacy as an eminent international businessman and philanthropist. Under his guidance, McKenzie Seeds became the largest seed production and distribution business in Western Canada. The Brandon Sun commented that "... ‘McKenzie Seeds’ are household words in every agricultural home in all Western Canada." 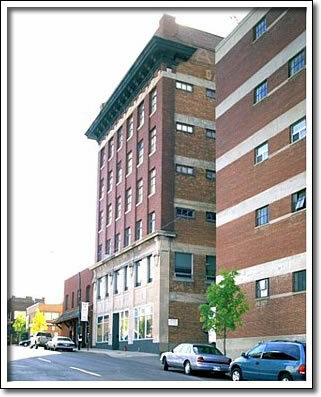 This six storey reinforced concrete and brick office and warehouse was designed in 1910 by Thomas Sinclair, a prominent Brandon architect, and constructed for $100,000 by the Brandon Construction Company under the supervision of Thomas Harrington. The utilitarian building has decorative highlights such as voluted shield capitals, which support the second-storey cornice. An eighty-foot concrete seed bin added in 1918 was designed and constructed by the Fegles and Bellows Company. Keenly interested in higher education, McKenzie established the A.E. McKenzie Endowment Fund in 1939 to financially assist Brandon College. In 1941, he was given the honourary degree of Doctor of Laws by the University of Manitoba. To ensure financial support to the College, the balance of McKenzie’s shares in the corporation were turned over to the provincial government. A.E. McKenzie Co. remained a Crown corporation until December 1994, when it was returned to the private sector.